Love Your Heart with these Power Bowls! I’m a life longer learner and passionate about eating, delicious wholesome food! 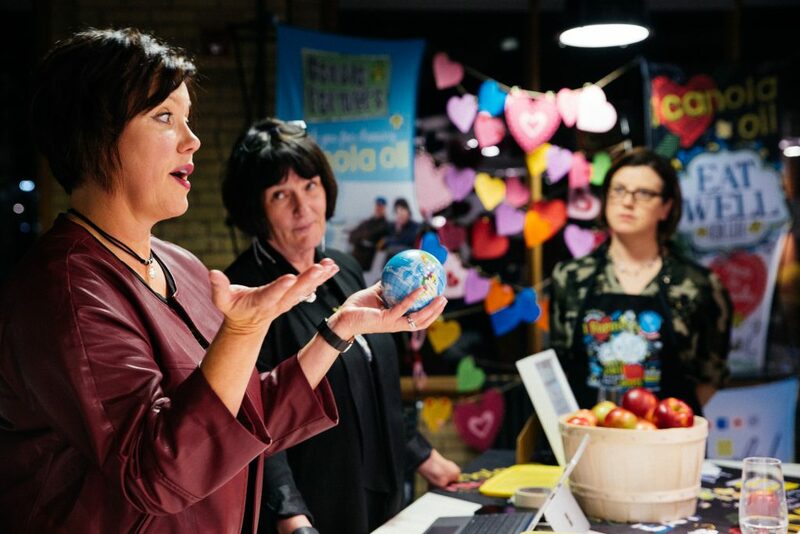 So when I was invited to a Love Your Heart – #CanolaConnect Culinary Workshop hosted by Canola Eat Well, I immediately jumped at the opportunity! 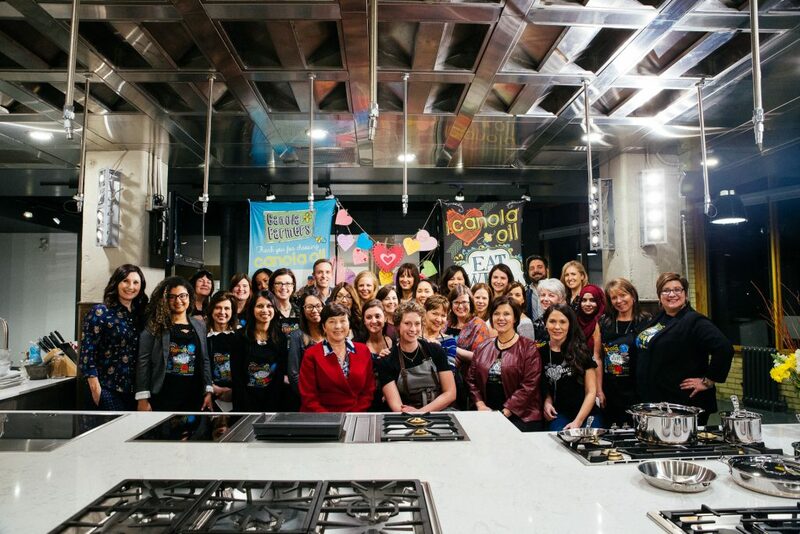 It was an evening of learning, cooking, tasting and networking. Here are the event highlights! A fun evening of learning with my dietitian buddies! Photography by Josh-Tenn Yuk courtesy of Canola Eat Well. The evening began with a spread of delicious appetizers ranging from Beef Tartine on Marble Rye with Hummus and Marinated Feta to Pommes Anna with Anchovy Chili and Cured Yolk. My hands down fave was the Marinated Zucchini with Fresh Ricotta served on a Baguette Crostini. What a winner – super presentation, a combo of textures and made with canola oil! Confession – I went back for seconds! One of many tasty appetizers! Photography by Josh-Tenn Yuk courtesy of Canola Eat Well. I was absolutely thrilled to meet Alexandra Feswick, Executive Chef at the Drake Hotel in Toronto! Inspired by local ingredients, Chef Alexandra created this gorgeous Power Bowl that’s bursting with flavour, colour and heart healthy goodness. 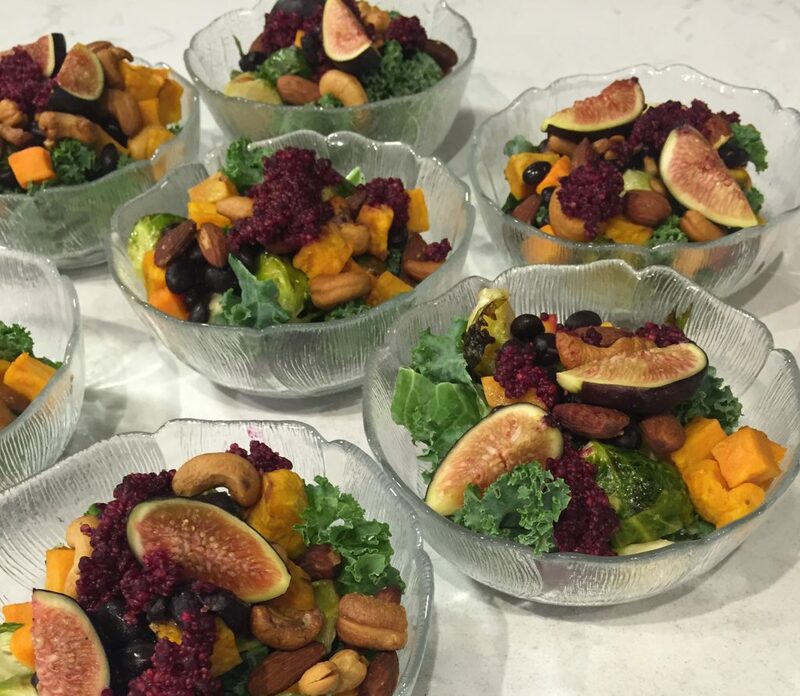 “The combination of veggies is endless,” says Chef Alexandra whose salad bowl includes kale, Brussels sprouts, beets, sweet potatoes, avocado, figs and black beans. 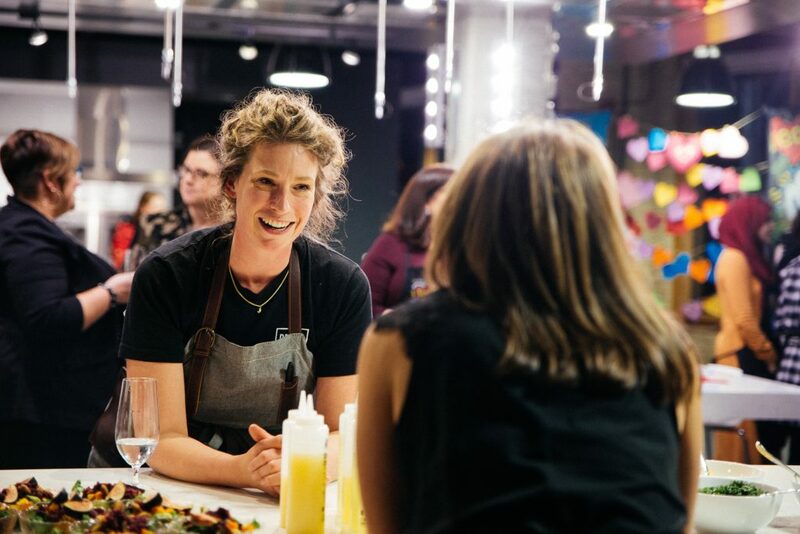 Chef Alexandra Feswick. Photography by Josh-Tenn Yuk courtesy of Canola Eat Well. Mixing our own salad dressings. Photography by Josh-Tenn Yuk courtesy of Canola Eat Well. 1. Combine lemon juice, Dijon mustard + canola oil together until well combined. 2. Add in crème fraiche + garlic and mix. 3. Gently add in mixed herbs and fold into the rest of the mixture. 1. Marinate kale with Green Goddess dressing. 2. Add in the remaining ingredients and toss together. Farmer Jeanette cares about producing safe, affordable and nutritious food. Photography by Josh-Tenn Yuk courtesy of Canola Eat Well. 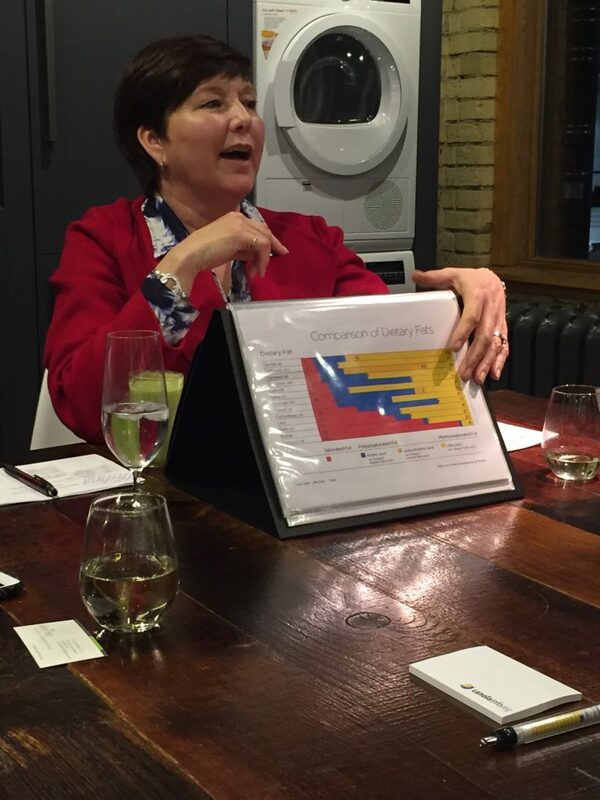 Shaunda Durance-Tod reminded us of the many nutrition and health benefits of canola oil. For starters, canola oil is low in saturated fat and packed with heart healthy omega-3 fats and monounsaturated fats. 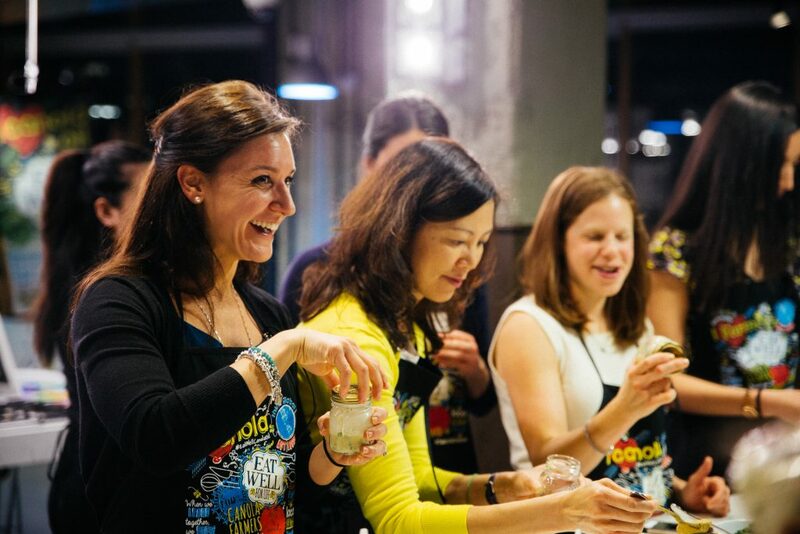 Plus it’s a good source of vitamin E and vitamin K.
Put 26 dietitians in a beautiful, spacious venue at Luxe Appliance Studio, and you’re bound to get great laughs and inspiration! In honour of Heart Month, we were asked to share how we love our hearts. Chef Alexandra goes for a run. Farmer Jeanette practises meditation. Dietitian Shaunda stays calm. And me? I wake up with a heart full of gratitude and practise yoga daily! What about you? How do you love your heart? 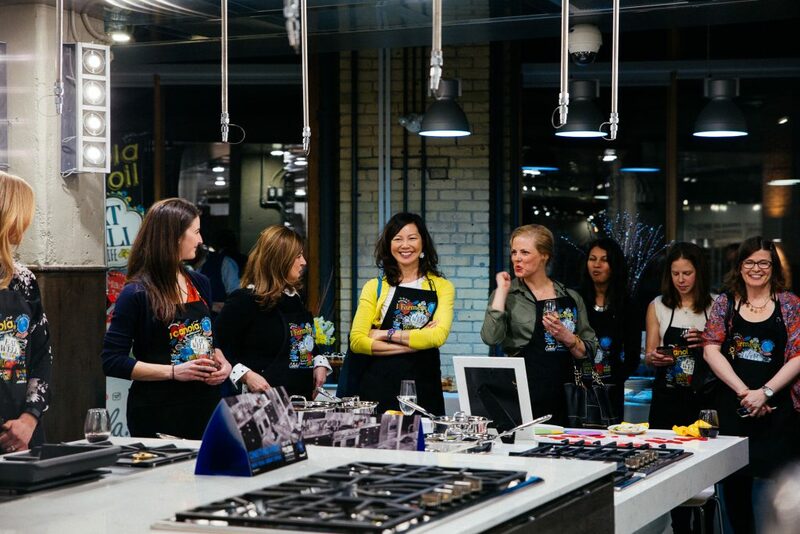 Fun and friendship at the Luxe Appliance Studio. Photography by Josh-Tenn Yuk courtesy of Canola Eat Well. 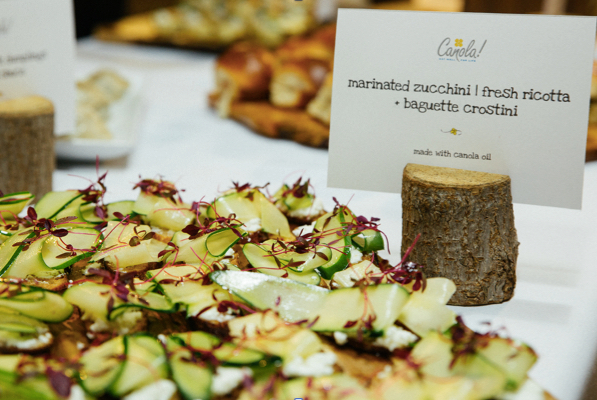 Disclosure: #CanolaConnect was a sponsored event for dietitians and this is a sponsored post. All thoughts and opinions are my own. 66% of Packaged Foods Contain Added Sugar! A recent study in the Canadian Medical Association Journal found that 66% of processed foods contain at least one type of added sugar in the ingredients list. 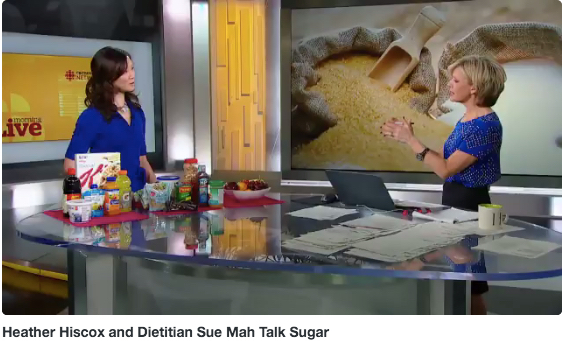 Registered Dietitian Sue Mah shared her thoughts on CBC News Network. 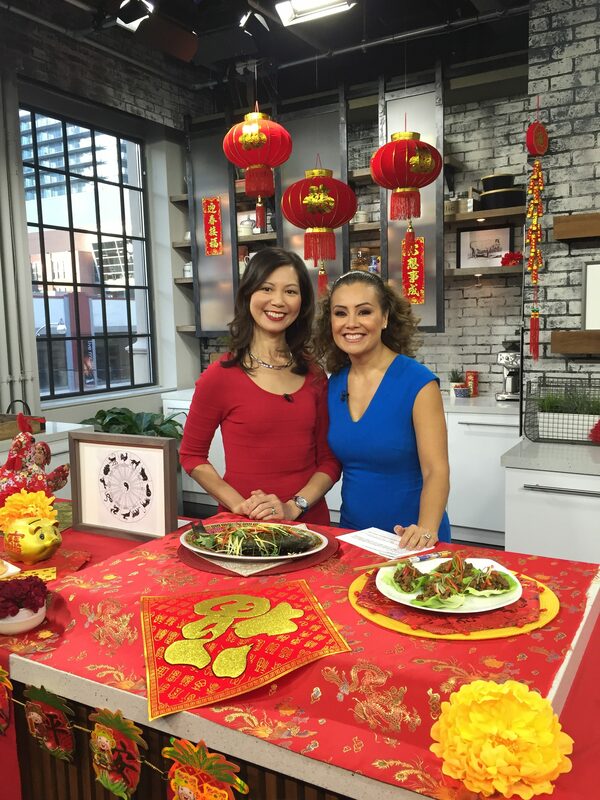 Lucky Foods for the Lunar New Year! Kung Hei Fat Choy! January 28, 2017 is the Lunar New Year and it’s the Year of the Rooster! 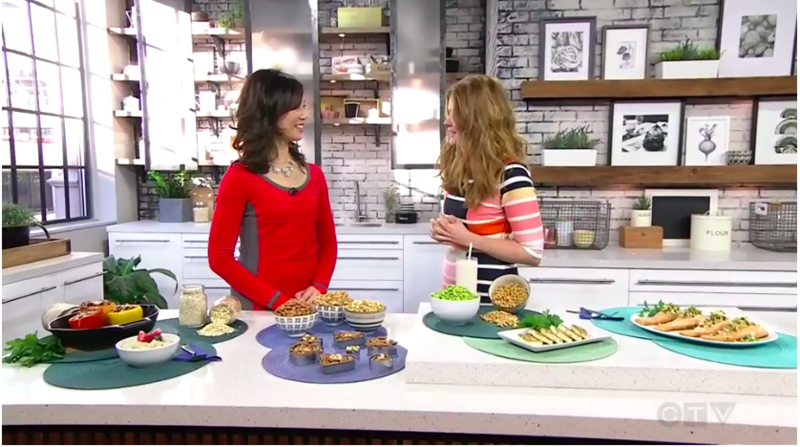 Watch my TV interview about the do’s and don’ts as well as lucky foods to ring in the new year! •	Wear red! It’s a lucky colour and is thought to scare away the bad spirits! •	Repay your debts so that you have no money owning going into the New Year. •	Give or accept lucky money envelopes. If you’re married, you give lucky money to your kids, nephews and nieces. If you’re single or unmarried, you can still receive these lucky money envelopes from your parents. •	Clean, sweep or dust your house because it will sweep out the good luck. •	Wash your hair. This is also thought to wash away the good luck and good fortune. •	Speak any negative words. For example, don’t talk about death and don’t say the number “four” because this sounds like the word for “death” in Chinese. This is always on the menu for the Lunar New Year because the Chinese word for fish sounds like the word for “abundance” or “having a lot”. Fish symbolizes an abundance of money and wealth. 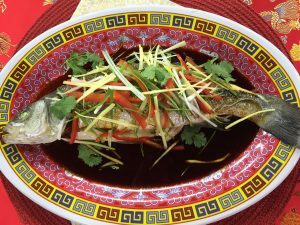 The steamed white fish is served whole, with the head and tail intact, as this symbolizes a good start and end to the new year. The head of the fish is turned towards the elders as a sign of respect. The Chinese word for chicken sounds like the word for “prosperity”. 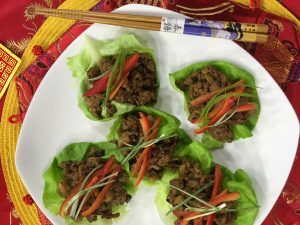 In this Lucky Chicken Lettuce Wrap recipe, you can use chicken breast or ground chicken. The fresh green lettuce (“choy”) represents wealth. Also, iceberg lettuce, bibb lettuce and romaine lettuce all symbolize longevity. The boat shaped dumplings symbolize wealth and resemble the shape of the gold and silver ingots which were used as money 2,000 years ago. 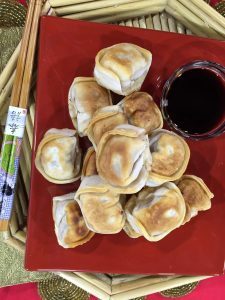 Legend has it that the more dumplings you can eat on New Year’s, the more money you will have in the year! Long noodles symbolize a long life. The noodle dish is often prepared as a vegetarian entrée and is made with a variety of vegetables – carrots for the lucky colour orange, and cabbage for the wealthy “choy”. 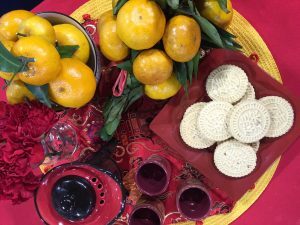 For a sweet start to the New Year, enjoy mandarins / clementines and almond cookies. Oranges with the stems and leaves intact symbolize life and longevity. A refreshing light meal or cool summertime appetizer when it’s just too hot to cook! Bonus – you can use fresh mint and basil straight from your garden! 1. Boil water in a kettle. Pour boiling water into a large bowl. 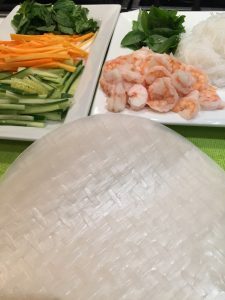 Soak rice vermicelli in hot boiling water for about 5 minutes or until noodles are soft. (Or boil rice vermicelli in water for 5 minutes.) Drain. 2. Fill another large bowl with warm water. Carefully dip one rice wrapper into the warm water for 8-10 seconds so that the rice wrapper softens. 3. Place rice wrapper flat on a cutting board. Place 3 shrimp halves in the middle of the rice wrapper. 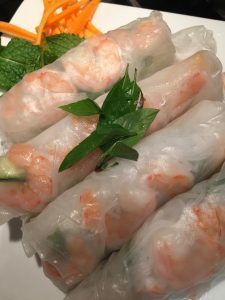 On top of the shrimp, layer on 3 basil leaves, 3 mint leaves, about 1 Tbsp of rice vermicelli noodles, 2 carrot sticks, 2 cucumber sticks. Leave about 2 inches uncovered on each side of the rice wrapper. 4. Fold the short uncovered sides in towards the centre. Tightly roll up the rice wrapper. 5. Repeat with the remaining ingredients. As you are rolling up the remaining rice wrappers, cover the already made spring rolls with a damp towel to prevent the rice wrappers from hardening. 6. Serve with a sweet chili or peanut dipping sauce.